Gently graduated layers resemble richly colored stone, forming a column candle of surprising beauty and sophistication. Beaded jute rope belt and faux granite holder plate are fashionable accents. 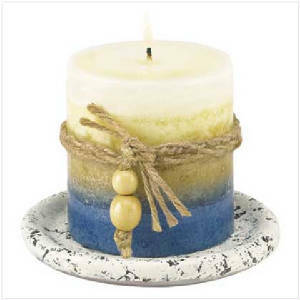 Brightens any room with a warm spark of candlelight and a subtle hint of color and scent! Paraffin wax with plaster holder. Fresh Ocean fragrance. 4 1/2 diameter x 3 3/8 high. 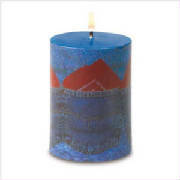 Blue-jean style graphics, complete with patchwork pockets and jaunty red bandannas, gives casual appeal to an indigo column candle. Whether your style is country-cute or Wild-West romantic, this happy blue-hued accent adds a bright bit of fanciful color! 90% paraffin wax; 10% palm oil. 3" diameter x 4" high. 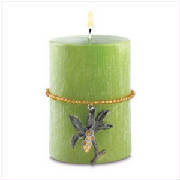 A sparkling strand of amber beads with a bejeweled enamel palm-tree charm encircles a textured column candle of lush leafy green, adding a playful touch of glittering glamour. Tropical-paradise scent is a pleasing reminder of the fresh fragrance of the rainforest! 90% paraffin wax; 10% palm oil. 3" diameter x 4" high.